from TOP 3 Search Engines Google , Yahoo and Bing ! Here we will spread minimum 100k+ Traffic for 30 days in default and if you want to adjust days please contact us first to inbox. You can provide up to 20 links to split total traffic. Here we will provide traffic from USA. If you want to target countries or regions like Europe , Asia, Africa, Australia, etc please notify that clearly in order requirement. In here traffic will not provide for YouTube videos. But if you want views for YouTube videos please contact us inbox. We are trying to start all the orders mostly within 24/48 hours. Once the traffic started the order will be delivered in 3-5 days and will be continued till reach all the targeted amount of days. 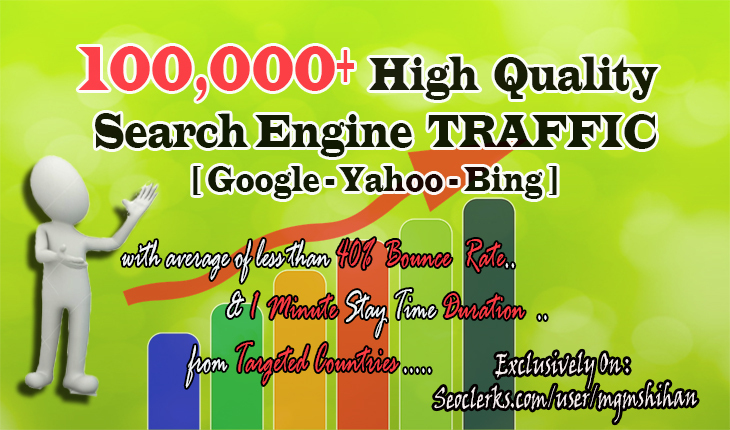 100k+ High Quality Search Engine TRAFFIC with Low Bounce Rate is ranked 5 out of 5. Based on 18 user reviews.